Hi Hi Posse People, Portia from Australian Perfume Junkies and I don’t know about you but I have an enormous collection of soap. Yes, soap. I have the high priced hoity toity ones, buy 5 in a box from the supermarket ones, independent perfumer ones, some sent to me as gifts and many, no make that MANY that I’ve bought myself. Yes we are talking about the hunk of soap, bar of soap, shaped, molded, cut, on a rope kinda soap, best smelling soaps. Not shower gels, bath oils, bath bubbles etc though I too have quite the collection of each of these. Soap. Best smelling soaps. S O A P. What are my favourites and why? I thought I could give you a few, at different price points, that I think are my best smelling soaps. The soap name will be the link to where I grabbed these little rippers, so if you like the look of something, hit the bold, big title. Patchouli Lovers by Olympic Orchids: Ellen Covey is amazing. If you love her fragrances then the soaps will take you to another level of adoration. They are long lasting and sudsy that leave you clean but not taut. 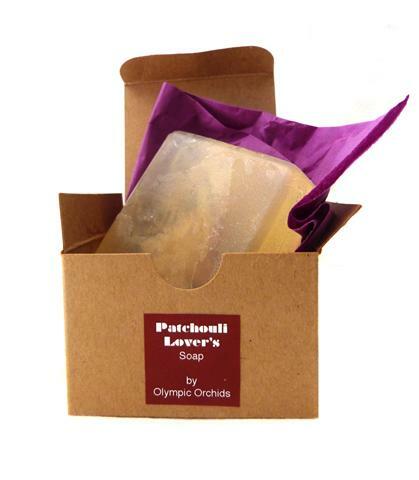 My skin feels supple and moisturised after using any of the Olympic Orchids soaps. They are often added to small gift packs for birthdays and Christmas and everyone that has received one calls to find out where, how and who from. Patchouli Lovers is a particular favourite for me because it lays a great base for any patchouli frag, or one that needs a little patchouli oomph. Banho Citrus Verbena by Claus Porto: The first thing you’ll notice is the size. These soaps are ENORMOUS!! 12.34oz it goes on smooth and rich,. smells so refreshing and uplifting. When I use the Banho Citrus Verbena it is a wonderful way to wash away the blues. They feel super luxe and are so oversized to begin with that its kind of comic to use them. LOVE THESE. Tabac Original Luxury Soap by Maurer & Wirtz: This is the soap we are currently using in the bath/shower and every time I wash it brings fond smiles of rememberance for me because it was what my Dad used for aftershave. The soap is deliciously fragrant and sandalwood, citrus and amber are what grab me most when I bathe with it. Tabac is definitely a best smelling soap for me, smelling both clean and creamy, and surprisingly lavish for a very reasonable price. 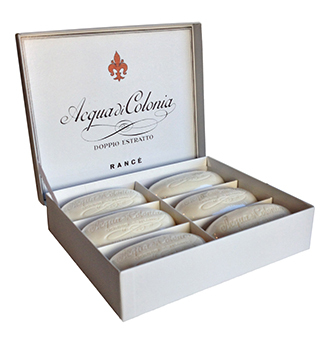 Acqua di Colonia by Rance: Here is one of the kings of soap. I was lucky enough to be gifted this spectacular box of soaps, two are gone and I get one out regularly just to smell it. Even through the plastic coating the fragrance escapes and I swoon. This is the soap to buy someone to show them that you are in earnest. To be honest I find the Rance fragrances a bit too safe but the soaps, OMG! Spectacular. LuckyScent says: Acqua di Colonia is a creamy bathing soap originally designed for Catherine di Medici. Fragrances used are Bergamot, Citrus, White Flowers and spices. Presented in a white gift box with black and a touch of red overlay. 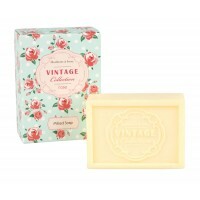 Vintage Rose by Heathcote & Ivory: I love a bargain and this was currently in Australia’s Target stores for about $5. Had I know it was going to smell so good and wash so beautifully I would have bought armloads. Sold out in Oz but still available at Heathcote & Ivory this lovely triple milled soap has rose, lily of the valley, jasmine some woods and musk. Very nice, well priced, beautifully embossed and lasted forever. The little box it comes in is super cute too. 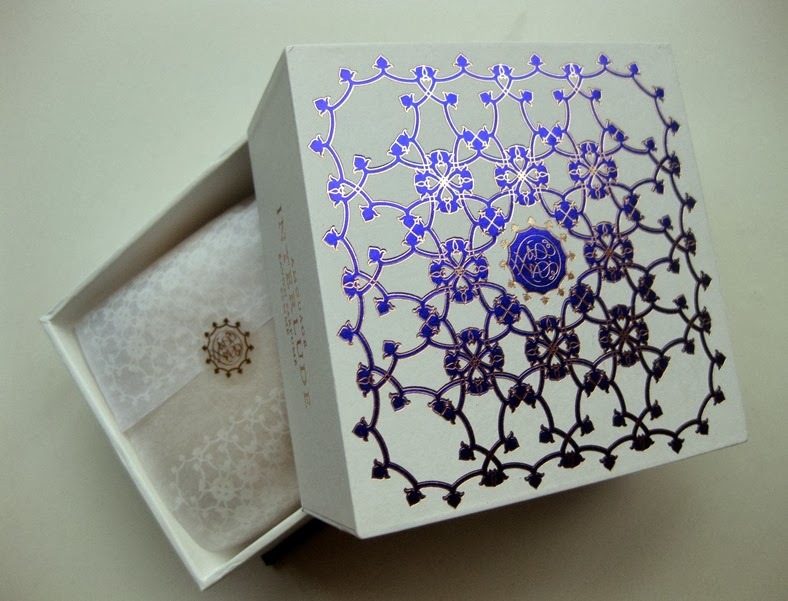 Amouage Interlude Woman: I have the 4 x 50g gift box of the Amouage Interlude Woman soaps. OMG! Firstly the box alone was worth the price. The scent is thick and pungent, a perfect base for anything Middle eastern in style but under Interlude Man it gives an even lusher depth to a fragrance that basically wipes my brain clean of all but itself. I am near Stendahl Syndrome when I layer them. Pictured above is the single soap; I have the 4 pack and it is freaking LAVISH! Surprisingly affordable too, great gift. So what is your fave soap, or soaps? Share with this soap glutton your soapy secrets, your best smelling soaps. Do come over to Australian Perfume Junkies and say HI, we love visitors, after you’ve left a comment here continue the fragrant conversation over there. Portia, thanks for this review I’ll look out for some of those. I LOVE old fashioned soap bars as opposed to liquid soap, and when I see a nice one I buy it and put it in my wardrobe, that way it’s always a bit of a treasure hunt which one will be found and used next 🙂 My absolute favourite though is vintage mitsouko soap, you wouldn’t believe how amazing it smells. WOW Asali, Where did you find vintage Mitsouko soap? LUCKY you. Roger et Gallet Oeillet Mignardise soap. Pure potent carnation amazingness. I hardly every use the stuff to wash with but I keep a box of it in the sock-and-underwear drawer so I get a whiff of it every day. 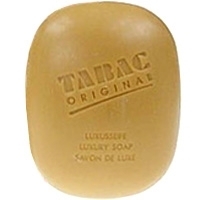 I really need to look for the Tabac Original soap. I used to wear the cologne back in the day and I bet the soap would take me right back. Perhaps when I’m in Germany next year. Aha! I’m yet to spend any time with the Rogerv & Gallet soaos but they often look tempting. I’m currently using the Banho Citrus Verbena but the Amouage sounds yummy!! I love pretty soaps. The Banho rocks, I really love the enormity of it. I’ve got an inexpensive favorite: Dove Shea Butter Beauty Bar with Warm Vanilla. It is very moisturizing and smells great! Glad you and Jin both like it. And birthday wishes to you! Happy, happy birthday, dear Portia! And what a fun post. I can’t believe I don’t own any perfumed soaps, but your picks sound so good that that will soon change. I didn’t realize the Amouage had created an Interlude soap — to the top of my wish list it goes! Thanks! P.S. Can you buy just one Interlude soap? Money’s tight right now and a box of multiple soaps would blow the budget, ha! Thanks for the Happy Birthday wishes. It was a lovely quiet birthday. planned inaction, heaven. FragranceNet has the single 150g soap for $26 with coupon. It is YUMMY!! Gah! I was doing alright ignoring the Amouage soaps. Pleeeease stop tempting meeee! 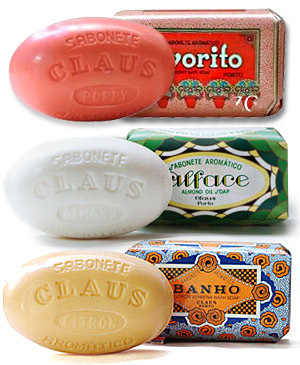 I love those Claus Porto soaps, especially the Poppy and the Honeysuckle. Mistral also makes some great ones and the Savon de Marseille sandalwood is great, I often add one to my Amazon order. I usually have one scented bar and one unscented going at any given time. I have to admit, my current favorite bar soap is the plain Verde olive oil soap by 80 Acres. The bar itself smells so good, although it leaves no lasting scent. It isn’t a hard bar though so one has to watch out not to leave it wet. What do you mean about it not being a hard bar? It’s a gel? Sometimes if bar soap isn’t cured it dissolves quickly (they often foam nicely and have softer lather). That is what I meant. You know how sometimes an artisan bar soap will not be as hard as a commercial one? OMGosh! SOAP! Honeydoll, I wonder if you and I pooled our Soap Hoard, would the planet tilt on its axis from the sheer weight of it all? Lyric. Jub25. Gold. Each an inexpensive, precious little gem! I had to laugh because of your list above, there are only two I don’t have. I nearly broke my foot when I dropped a Claus bar. freakin’ dangerous, lemmetellya! Erin turned me on to those Eggwhite soaps. Great for your skin (esp face) and one leetle bar will scent a good-sized bathroom for weeks! Just beautiful! So CLEAN-smelling. On one of our Saturdays Francine, we found a gorgeous Almond no-name soap that just floated my bathroom boat for 2 weeks – so retro-Jergens. Alas, once it got into ‘use’ stage it sort of lost its charm. Alas. But…$6.99? Two weeks of retro beauty? Can’t beat that with a stick! I’m with Jin on the Dove. Great smell, great moisturizing. Guerlains. A box of four Eau Imperiale that I got from surrendertochance.com – Too lovely for words. On NOOOO I can see those Banho might be a little dangerous. Ooops, OW! Woo Hoo, SEE YOU SOON! I have just the Dia hand soaps. Got them a couple weeks ago and haven’t tried them yet. Ordered a slew of Amouage body products and haven’t even started to use them. But I love the Amouage packaging, the packaging and bottles fit what’s going on scent wise. Use those hand soaps in the bath, gorgeous. I also got Dia soap recently but haven’t used it yet. But it smells wonderful! HAH!! We are destined to be collectors Nemo. Yes the olympic Orchids are very special. I love your soaps and want to try them all. 🙂 I no longer make regular travels outside the US (life gets in the way) but I am hoarding the Roger & Gallet soaps I’ve bought in France on past trips. They smell so wonderful and have incredible longevity. I have several empty R&G soap boxes that are at least 15 years old. The boxes alone still smell fabulous. One of my dearest friends has a collection of soap boxes that she keeps her different receipts in. It means A) she gets to keep them, B) they get used and seen regularly, C) something dreary become at least a little less so. I often think it is a good idea. He He He! We are a crew of soapies, soapumistas? Yes, I love your childhood stories of soap. Avon used to do excellent scent in all its products. Yes, Portia, there is no way even the most fragrant of “body washes” can compare with caressing (hey that’s actually a nice grocery-store one, as well, “Caress”) a smooth BAR of fragrant soap….LOL…such a Soap Geek I am (but your terms are prettier!). Avon DID do so many things so well!! I loved for the Avon Lady to come. (She knew I was a Perfumista in the making, too, and once gifted me with one of the little floral multi-fragrance tester collections like I just saw offered on one of the links here…I am sorely tempted!) But I digress… one of my favorite memories is WINNING a Miss Lollipop (Avon) soap and sponge set (at bingo) at an event my parents took me to; in retrospect in probably smelled like a lot of the sugary, fruity fragrances popular now…but, oh how I loved that! It was a BIG pink and white marbled disc…almost too big to hold (like I imagine the Claus bars! ), but oh, it was Heaven! Ha, ha…I know how I must sound! Glad to know there are other Soapies out there! I LOVE soaps too – I hardly use body washes/shower gels any more..I use cold processed soap- those tend to be my favorite which is why I am excited to try the olympic orchid ones though I could find the patchouli one on her website..
For me – the texture of the soap and lather are as important (if not more) than the scent. My absolute faves are from the following small companies : chagrinvalleysoapandsalve (not so much for the scent but the quality of these soaps are outstanding and most of them do what they claim), aunt nancy’s soap on etsy (I love her unfragranced soap like her goats milk soap but she has fragranced soap as well- I’ve used and liked her fleurs d’oranger soap. For scented soap I love Olive and Oud on etsy. Laura, the owner, is on a break right now but her Ernest Hemingway soap (Which reminded me of Caron Alpona) and Perfect Morning soap (with coffee absolute) were my favorites. She used to have a wonderful orange patchouli and sandalwood soap which was was also a favorite. Robert said “Roger et Gallet Oeillet Mignardise”–I had that, minus the Mignardise–perhaps the same? No longer available from anywhere I could find. I loved it, covet it still, and in fact have looked a long time to find a perfume as satisfying (DSH Oeillets Rouge comes close). I also enjoy Pre de Provence Linden soap. Both cited are triple-milled with lovely lather and abundant scent. I still have two soap bars left of Opium – YSL from the early nineties, love them! Also love my vintage soap of Farouche – NR. When I visit France I cannot resist to buy every kind of soap and showergel, that is unknown to me, in supermarkets. I just love a huge stock of soap! Oh yes, I am the same when overseas. STOCKING UP!! Nesti Dante are the best. I cherish the memory of the Camay soap in my grandmother’s bathroom. Currently my favorite soap is Honey I Washed The Kids by Lush. Reasonable price and nicely emollient. Can you still get Camay? I love, borderline lust Sandalwood. Chandrika Sandal and Auromere Sandal-Turmeric are stashed in a cigar box in my closet…just in case they never make more. Any suggestions for other exquisite sandalwood bars?